Thanks again alex this is a fantastic build I love it. I am getting some switch pop now that i boxed it. Idk why my real one has a subtle pop when turning off. this is pretty loud but not as loud as true bypass its like half as loud idk i guess it is what it is. Same pop on both footswitches? 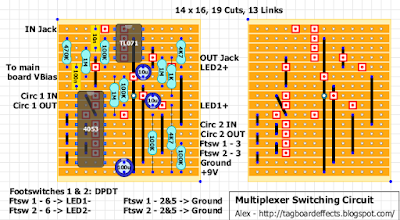 Maybe adding a 1M or 2M2 resistor from IN Jack to Ground (there is space on the Multiplexer Switching Circuit from IN Jack to TL071 pin 4) would solve the problem? Haha, I totally just sold my silver one. I have the Red one VJH1 version 2D copyright 1997-2004, and there is a switch marked S2 just like the silver one shown above its right under the spot for the black jekyl toggle switch. This version has 2 toggles one for each side and 2 stomp switches one for each side the the internal switch just like the bypass shown above. 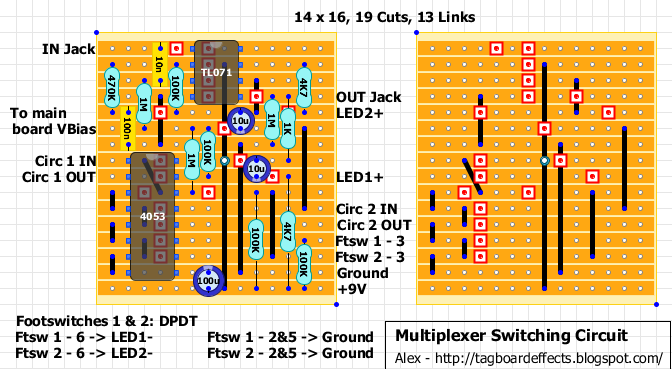 Can anyone tell me what the 3 different on off or on on switches do?